We recently got an email from Classpass telling us we’ve been chosen to try out their new beta program that was to begin Friday, November 10. You’ve been selected to beta test credits, a better way of booking classes. Credits give you more value and flexibility with your ClassPass membership, all at the same rate you pay today. From what we understand, credits will allow users to use more classes and your membership rate remains the same. You don’t pay anymore for credits. Supposedly, we’ll get at minimum one class per month (if you have a one class plan), but now classes have varying values, so there’s the chance you can take more classes with exactly the same plan and money you’re paying. In our test, we got 9 credits to use. We did a quick search and found that Barry’s Bootcamp was a full 9 credits, but certain gym times cost only 2 credits! Lower credit classes tended to be yoga classes, gym times, or class times during less busy times. Not bad. Under the old way, I would be able to take one gym time for my $15, now I am able to take four gym times under the same plan. 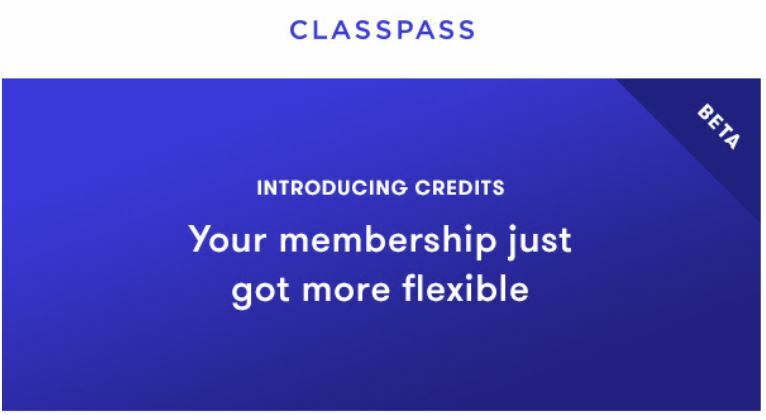 And another good thing about credits is that Classpass is removing studio limits meaning users can visit their favorite studios more often without spending opening up your wallet or purse. How Do Classpass credits work? Classes have different credit values based on time of day, popularity, equipment used, how often you visit in a given month and more. For example, classes in New York range anywhere from 1-9 credits.